By craig stennett — Quite an interesting story up on Germany's Northern Baltic Coast for The Daily Telegraph (UK) From the piece by journalist Jörg Luyken;..
By craig stennett — I was on assignment last week for The Daily Telegraph at TSG Hoffenheim's training ground in Zuzenhausen, Germany. Specifically to make a..
By craig stennett — Not my usual line of work of Politics and Social issues. However, Siggi and his Band ‘Pork Pie Textura' were the first people to ever..
By craig stennett — I was on assignment in Berlin this weekend. Outside my commisioned duties i stumbled across this situation to photograph on the way to my event. A.. Article 13 Protest, Leipzig, Germany. By craig stennett — Having a demonstration filled weekend. Today it's; Save Your Internet Protest in Leipzig, Germany. Protesting against the Copyright Directive..
By craig stennett — Friday for Future, School Strike for Climate demonstration here in my closest city Halle (Saale), Saxony-Anhalt, Germany. Over 1,4mn on..
By craig stennett — Last year Chief Almir Narayamoga of the Surui Tribe from the "7th September Indian Reserve" Rondonia, Brazil had his Book published in..
By craig stennett — Often on demonstrations these days i find the amount of Police outnumbering the actual demonstrators! Police trail the Orange Block Anti Racism..
Gertrud Graf, Omas Gegen Rechts, Berlin. 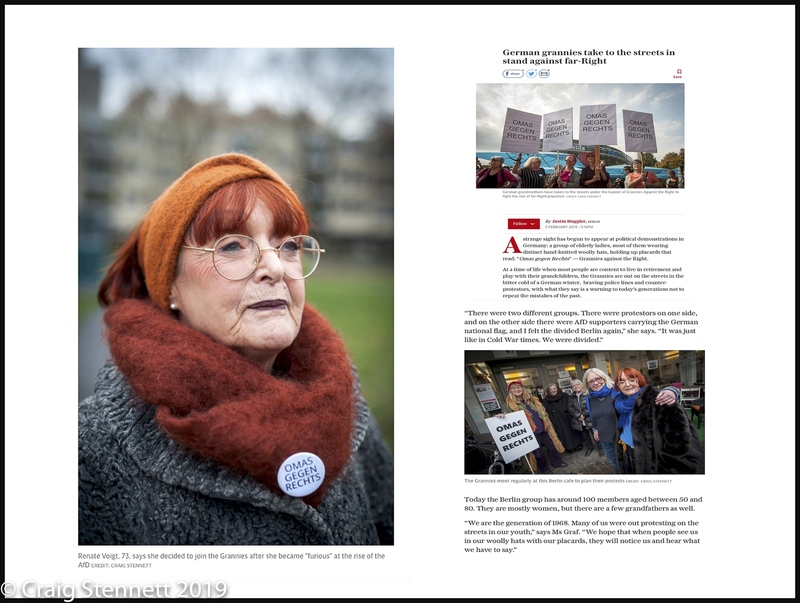 By craig stennett — The wonderful 67 year old Gertrud Graf of the Berlin chapter of Omas Gegen Rechts-Grannies against the Right. 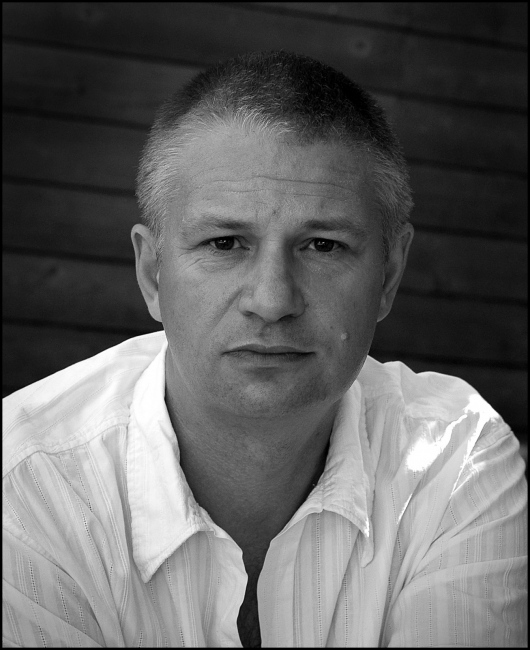 Photographed near her home in..
By craig stennett — Image of mine from my time with DOVO bomb disposal unit in Belgium. It was supplied by ‘eyevine‘ the London based photo agency where all..
By craig stennett — Pleased to see that MSF picked up on a couple of my images from the set I supplied to them as a courtesy for allowing me to hang out at their..
By craig stennett — Image nicely used to illustrate an article in the US based Science Magazine. Taken during my time in the rainforest‘s of Brazil with the Surui..
Jadon Sancho at Borussia Dortmund, Germany. By craig stennett — Always disappointing when an assignment you have been commisioned to photograph gets unused and an agency picture is put in its place. Ho hum..
By craig stennett — One of my Images from Ramallah in the West Bank was used in the Lonely Planet guide to Palestine for this year. I was actually in Israel for another..
By craig stennett — The House of the Identitarian Movement in Halle (Saale) is a center and residential project of the right-wing identity movement in..
By craig stennett — Nice use of one of my images of the Deutsch Forester and Author Peter Wohlleben in Canada‘s ‘UCObserver‘ magazine. ..
By craig stennett — At the ‘Wir haben Satt'- We are fed up- demo in Berlin yesterday. The annual demo calls for (in there own words) Good food, a..
By craig stennett — I was on another assignment in this part of Germany so decided to visit this notorious site I'd heard about as a child at school. The very..
By craig stennett — The second portrait from my ongoing series on-'Omas Gegen Rechts'- Grandma‘s against the Right-in Berlin, Germany. Bernadette (name..
By craig stennett — The Ypres salient on the fields of Flanders in Belgium is the biggest mass grave yard of the British Army anywhere in the world. The carnage of WW1..
By craig stennett — Nice use of one of my images from the Trappist Brewing monks at Koningshoeven Monastery in Holland in todays Guardian (UK). By craig stennett — Just started a portrait project on the wonderful Anti fascist Movement 'Omas Gregen Rechts'- Grandma‘s against the Right. This..
By craig stennett — My Portrait of Anne Mette Høyer Head of Business Relations for SAP. Photographed at their offices in Walldorf, Baden-Württemberg, Germany. For The..
By craig stennett — My story on the anniversary of WW1 in Flanders, Belgium is out now in Readers Digest (UK). Spent a fascinating and moving 7 days there earlier this..
Hand in Hand Schools, Israel. By craig stennett — I'm off on travels again and back to Israel to work with the fantastic organisation Hand in Hand. I wrote a feature on Hand in Hand a year or so..
By craig stennett — World heavyweight champion Anthony Joshua will return to the ring on October 28th against Bulgaria’s Kubrat Pulev, who is Joshua’s IBF..
By craig stennett — Potter Rene Klohte in his Pottery Halle-Salle, Germany. Flanders Fields Battle of Passchendaele 100 year Anniversary. By craig stennett — I had my writers hat on alongside my photographic duties on a feature in Flanders, Belgium over the last couple of weeks. This year is the..
By craig stennett — Been on the Election trail in Germany for the last 3 days for The Daily Telegraph (UK). SPD under Martin Schulz evaluate their chances in the..